Amy Rajnisz was that one student in high school who could never answer the question: "What do you want to be when you grow up?" Now, Rajnisz is an Arizona State University alumnus from the Hugh Downs School of Human Communication and recipient of the 2017 College of Liberal Arts and Sciences Dean’s Medal. She was selected to receive the Dean’s Medal as one of the outstanding students who has demonstrated an unyielding commitment to academic excellence during her time at ASU. She had some obstacles along the way though. Originally, she had planned to apply as a journalism major at ASU’s Walter Cronkite School of Journalism and Mass Communication, but an adviser told her that she feared that Rajnisz would not live up to the potential of others at the Cronkite School. Also, Rajnisz had lived in the shadow of her older sister, having been told so many times that she was "not good enough" because her sister was better. The night before she applied to ASU, Rajnisz talked to her mom about the pressure she was feeling and how hard it was for her to feel like her own person when she had been in a shadow her whole life. She remembers her mom telling her that she wished her siblings would communicate as openly and honestly as Rajnisz did. That's when she knew she wanted to study human communication. “The lightbulb over my head went off and the next morning, I applied for a BA in communication in the Hugh Downs School of Communication,” she said. The best piece of advice that she would give to anyone still in college would be to challenge those that doubt you, even if that means challenging yourself. Coming to ASU as a transfer student was also challenge for Rajnisz. Not knowing a single person and feeling incredibly nervous, she attended Passport to ASU with her dad by her side for support. The pink Sun Devils Wear Prada booth immediately caught her eye and she was greeted by friendly faces. Rajnisz said she has learned two important concepts while at ASU: that her instructors only cared as much as she did and that it was okay to seek support. Previously, Rajnisz said she had always been timid to ask for help or make her presence known in class. But she decided that to start anew, she would build a good rapport with instructors and advisers like Carol Comito (pictured at left). She began introducing herself to every instructor the first day of class and would offer to help them in any way she could; feedback, notes, etc. She asked questions and challenged conversations. Rajnisz had also quietly battled anxiety since middle school and never gave it the attention it deserved. When she arrived at ASU, she sought out counseling and went once a month, every month. Rajnisz has a long history of volunteering while a student at ASU. She has been a stylist for Sun Devils Wear Prada since 2015; she volunteered to help oversee the Tempe Festival of the Arts; and she volunteered at Maggie’s Place, which provides pregnant women in need with resources and a supportive community. She is also bilingual in English and American Sign Language. 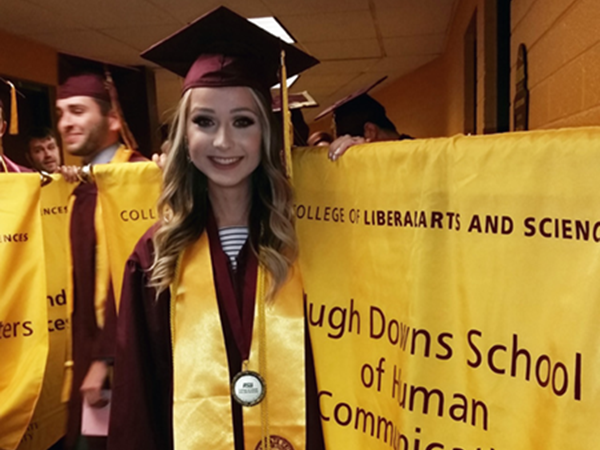 Between her volunteer work, rigorous coursework, living in student housing, working with different groups, and working in the food service industry, Rajnisz also found her patience tested at ASU. But she now takes all of those experiences to help her interact with people and guests in her current job with patience and understanding.